What is an "Oskie Woskie" you say? So there is nothing more exciting than finding a true "Oskie Woskie" as my photographer extraordinaire and I call it. I mean, a true old school dress is probably one of my favorite things to find. 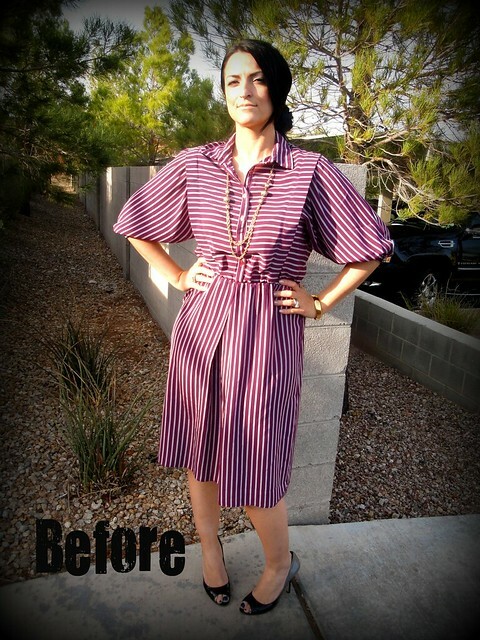 And this is how you can make a frumpy, Pilgrim OSKIE WOSKIE...a classic Vintage stylish addition to your closet. And might I add I paid $6.99 plus 20% off for bringing donations! and the belt was $1...that's all it needed! oh and the confidence to say.."umm yeah...I know..it is old, and I love it!" This outfit is so adorable and cute! Beautiful dress :) I love how you paired the purple with the blue from the belt. Good choice pairing that dress with a belt!! Super great outfit!! I think that almost anything can look good when it's belted! Cute! I love the dress! And your right the belt with it looks great! You've got a great eye! I really would have passed that dress up but really think you own the look. Nice post Shana. Huge fan of thrifting. We feature all thrift and thrifted or vintage redesign on our site. Your dress is adorable but with the belt and accessories... perfection! it is so awesome how different just wearing a belt does!